Rhodes is closer to Asia Minor than to the Greek mainland. 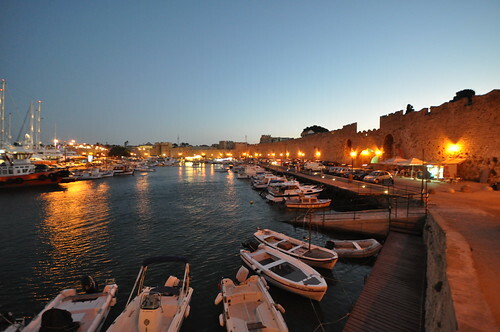 The island of Rhodes is shaped like a spearhead, 79.7 km (49.5 mi) long and 38 km (24 mi) wide, with a total area of approximately 1,400 square kilometres (541 sq mi) and a coastline of approximately 220 km (137 mi). 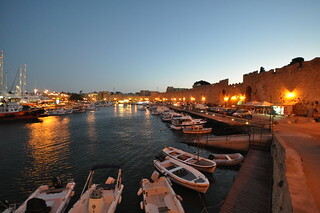 The city of Rhodes is located at the northern tip of the island, as well as the site of the ancient and modern commercial harbours. The main air gateway (Diagoras International Airport, IATA code: RHO) is located 14 km (9 mi) to the southwest of the city in Paradisi. The road network radiates from the city along the east and west coasts.